My mother was a Christmas junkie. I can still smell the pine aroma of the eight-foot tree that stood in our parlor in Hanover, Germany. Beeswax candles suffused the room with flickering light and a profusion of home-baked cookies weighed down the branches of the tree. Among the latter I was partial to tiny chocolate rings garnished with sprinkles and glazed cinnamon star cookies. For weeks prior to Christmas my sister and I had labored over handcrafted presents for my parents. These were now among the mounds of gifts spread out on tables adjacent to the tree. Even though they may have been reluctant about celebrating the holiday, my grandparents had sent gifts, including many characteristic German sweets. Parties of all kinds filled the week that followed, including one for my friends. During this event we prepared a meal with the cooking utensils of a good size dollhouse kitchen only set up during Christmas. The Christmas tree at Rockefeller Center, overlooking the ice skating rink. The trouble was—as I learned all too soon—that Christmas was not really my holiday. We were German Jews, living in Nazi-land, and this lavish celebration actually was my mother’s revolt against her own parents, in whose house a Christmas tree would never be considered. Soon I became aware of the grown-ups discussing the dilemma of whether or not Jews should have a tree, and my family never had one after we left Germany in 1938. My husband bought a menorah the year our daughter was born, and I did my successful best to arrange a festive eight-day candle-lighting festival for my children and then for them and my grandchildren. Just last week I cooked mounds of latkes (potato pancakes) for my family. I even could explain to my grandson’s new girlfriend that the holiday celebrates freedom, the victory of the weak against the mighty, and the fact that given the right faith and attitude, oil thought to burn for just one day can last eight. I grew up in three countries, speaking three different languages: Germany (German), Belgium (French) and America (English) and identify with each one. I belong everywhere and nowhere—quite. Their holidays are mine—but not quite. Would I have it otherwise? No. I treasure being multicultural, though I do envy people who have never to hesitate to tell others where they hail from, or question their loyalties. 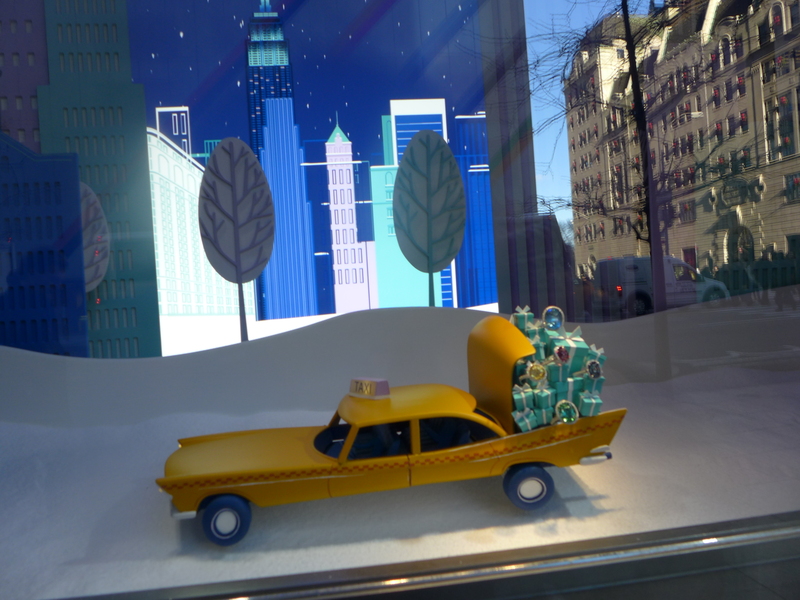 A scene from Tiffany’s holiday window display this year. And I do enjoy Christmas. 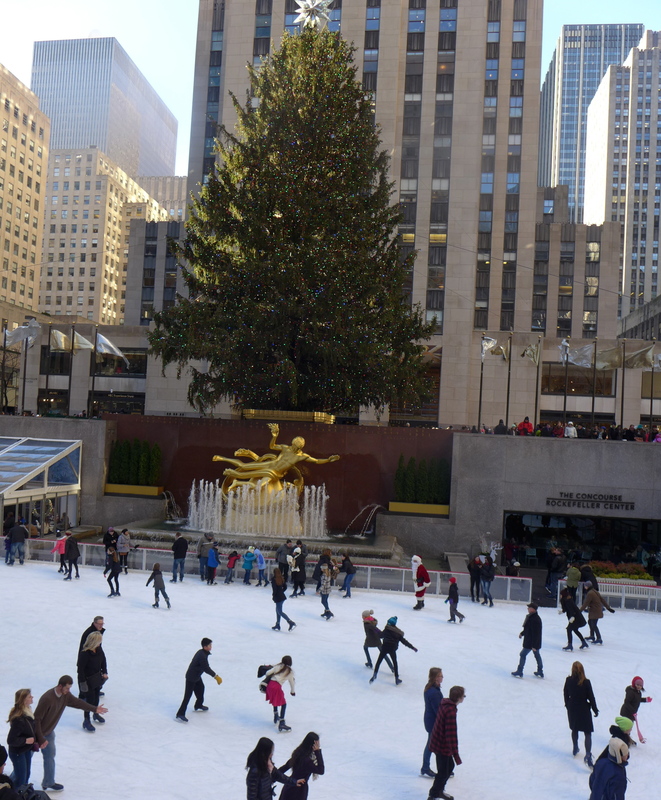 This year, like most, I went downtown to admire the Christmas tree at Rockefeller Center, which I own—a little—since I wrote a book (America’s Medicis: The Rockefellers and Their Astonishing Cultural Legacy) that recalls that the tradition dates back to the construction workers who built the Center from 1929-1939 and decorated a smaller tree in 1931 at the height of the Great Depression. I also walk along Fifth Avenue and immerse myself in the fantastic windows the luxury stores mount for our delight. This year, Saks Fifth Avenue illustrates five fairy-tales—Rumpelstiltskin, Rapunzel, Cinderella, Snow White and Sleeping Beauty—in luxurious Art Deco style. The main characters, glamorously dressed in sequins and silk, are silhouetted against iconic New York buildings, images of a city in which I do feel utterly at home. Tiffany too celebrates my city with miniature cartoon-like characters and objects, all shopping for magnificent jewels. I use my new camera to share my imperfect pictures with you, my readers, and wish you a happy 2015. This entry was posted in family stories and tagged america's medicis, christmas, family, family stories, family story, german jews, hanukkah, holidays, nazi germany, new york city, NYC, rockefeller center, rockefellers, tiffany, winter in NYC. Bookmark the permalink.